This is a joyous concept book that takes us through three seasons and the life cycle of the backyard garden. It stars a preschool-aged boy who is discovering the wondrous changes that happen between putting seeds in the ground and enjoying the fruits of his labours. This book is full of big, bright illustrations. Each mixed media drawing teems with life, every page crawling with the little and large creatures that we share our small corners of paradise with. 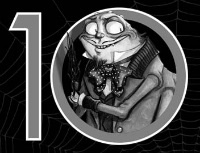 The art is cartoony and exaggerated, fun and energetic. The writing is full of gentle humour, in a voice that is easily grasped by young children, but still holds appeal for the adults doing the read aloud. And it has some lovely observations that reflect a real understanding of the way a little person sees the world. Teachers, use it in units that explore life cycles, plants, the interaction between man and the environment, and our food sources. It is also great for studying descriptive language, and text features like the creative use of font colour and size. Collins has another book in this series called In The Snow, and several others that she has authored and/or illustrated. Her blog is listed in the side menu. I am in awe of Mem Fox. I find that she has an almost solitary voice in a market glutted with books that star TV characters and snotty brats, and almost devoid of any kind of positive adult/child relationships. Fox does not write books for the sole purpose of entertaining children. Her books handle weighty topics and convey deep messages. WGMcP is about a young boy, barely in school, and his relationship with the folks who live in the old age home next door. He and his neighbours have a mutual appreciation, despite, or maybe because of living at the far ends of time’s ever swinging pendulum. But he has the greatest connection with Miss Nancy Alison Delacourt Cooper (who also has four names). Poor Miss Nancy has lost her memory, an idea that makes no sense to WGMcP. What kind of a friend would he be if he didn’t help her find her memories again? If only he knew what a memory was, so he knew what he was looking for. With the counsel of his wise neighbours, Wilfred learns the nature of memories, and he sets about collecting objects that he thinks fit the bill. A warm chicken egg, some sea shells, a puppet, a football, and a medal are all presented to Miss Nancy, one by one. And this is where you start to cry. Conditions like Alzheimer’s and Dementia touch us all more and more. 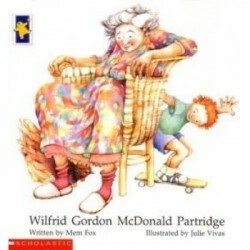 Beautifully written, Fox uses the special and necessary relationships that can form between children and adults to present the topic gently, giving parents and teachers a resource that will provide opportunities to discuss and learn about the effects of what is happening to their loved ones. As a teacher and an aspiring children’s writer, I read a fair bit of children’s literature, though, ‘literature’ is not the word I would use to describe some of the drivel that’s been published lately. For example, I recently read a Middle Grade fantasy that was completely ridiculous in its entirety. It was populated by cliche characters and preposterous situations, and had absolutely no grounding in reality. It was one massive contrivance that made me angrier with every page turn. But, I’m not interested in wasting a reader’s time with long descriptions of what not to read. Rather, I would like to share books that I enjoyed, so that I can promote good writing over the pulp fiction din that currently clangs from the presses of a desperate-to-sell publishing industry. 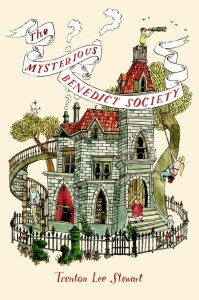 The first book I’d like to write about is The Mysterious Benedict Society, by Trenton Lee Stewart. It is Middle Grade, which means it’s aimed at children in and around grades 3 to 6. There are several books in the series, including a prequel, and they seem to be doing well. To impress upon you how much I enjoyed it, I read most of it over two days. I will not give you a plot synopsis or spoilers, except to say that a handful of exceptionally gifted orphans are recruited to save the world. I will tell you that the author knows his audience, as he gives exactly what they are looking for in an adventure. His characters are very relatable, despite being so unusual. Some of the situations are over the top, but not beyond the stretch of a healthy imagination. And, though some of it is predictable to one with thousands of plot lines pinging in his head, much of it is fresh and inventive, and even surprising. What I appreciated most, however, is that these children are not operating alone. These kids, who are all geniuses in their own right, in the middle of a perilous mission, still require adult support and guidance to get the job done without dying. This author acknowledges that these kids are being put at risk, and he doesn’t belittle or diminish the danger at all. Also, he doesn’t just have the children dumbly stumble into the danger and decide to pursue the adventure because of some unwarranted, arrogant belief that they are superior to any adult, or, worse, out of boredom. Nor does he have them appeal to all the grownups, only to be ignored or abandoned (Shades of Jacob Two Two). They are recruited by adults, to do something adults can not do, and their abilities and strengths are all the more valued because of this. One day I’ll write a post about just how ridiculous I think it is to exorcise positive adult influences from children’s books for the sake of empowering children. But for now, let me say that The Mysterious Benedict Society is a well written novel. It has a good, literally fantastic plot. It is written in elevated language, it includes some puzzles, and it demands some thinking from the reader. It has great characterizations (though a bit Dahlesque). And it has a couple of nice surprises at the end.